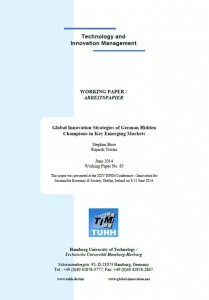 A new paper by Stephan Buse and Rajnish Tiwari of the Center for Frugal Innovation at the Hamburg University of Technology that examines product and market cultivation strategies employed by German mid-sized firms (“Mittelstand”) in the BRIC nations, especially China and India. The paper was preseneted at the XXV ISPIM Conference – Innovation for Sustainable Economy & Society, Dublin, Ireland on 8-11 June 2014. “Too good” to succeed? Why not just try “good enough”! High-tech, German companies are facing a curious problem: their products are reportedly “too good” for the expanding global markets. So in a way they get “penalised” for offering a superlative quality. At a second glance, though, this doesn’t seem surprising. For, succeeding in the emerging markets like India or China often requires developing market-specific products and services that enable an attractive value proposition without taking recourse to (excessive) over-engineering. Furthermore, the innovations should be able to cope with, and successfully circumvent, the given infrastructural restrictions ever so present in the rural and semi-urban areas in such economies.